Discussion in 'General Indian Domain Name Discussion' started by Truekumar, Feb 28, 2016. Now before I start to give my opinion on the Indian extension, I wish to convey the fact that I am definitely NOT trying to hype up the .IN scene to propagate my own portfolio or investments, which many people often believe when domainers make positive comments on certain extensions. Although I must say that I am the owner of a fair few nice .IN names, I feel that I am quite behind with .IN and therefore playing catch up on pretty much a daily basis now through hand regs and buying on reseller market, trying to build up a decent portfolio of .in at reasonable prices, before its too late. Many strong key (and clever) players have been in the .IN game for many many years, secretly trading amongst themselves and waiting for the explosion that is about to occur in the next few months. I started investing in .IN a few years back but it has only been over the last couple of years, that I have realized the true potential in this amazing extension. Many years ago, I had initially thought that .in was only good for domain hacks, with quite a few companies all over the globe buying .in names primarily for that purpose ( many still do) and not even thinking about the traffic from India but I realized a couple of years ago that I was very wrong about .in and wished that I had got in much earlier and I think that the Chinese are also realising that now too. I am sure you are all aware of the recent rapid momentum with NNN.ins & LLL.ins which are showing growth at an unprecedented speed, prices increasing on a daily basis. This shows the potential of .IN and also a precursor of what is going to happen in the coming months. And in a matter of speaking, I guess it is already starting to happen right now as we speak, with more and more end users buying .Ins and interesting being sparked all over India and globally too. After rapid increases in NNN.ins & LLL.ins sparked by the Chinese, then will come massive increases in sale prices of .IN keywords, which are already becoming hot property in India right now anyway. The .IN extension is definitely the future of the Indian Webspace and the market is starting to move extremely fast at this moment in time, some very exciting times ahead! Not sure if you guys have been keeping up to date with the news, but over the last few months, there has been some very big news about the Indian webspace market. Flipkart, India’s largest e-commerce company, raised $6 Billion in total venture capitalists, and $1 Billion just last year and the company is now valued at $15 Billion. This funding figure matches facebook’s fundraising back in 2011 and makes it the third largest deal of its kind in the world! Also during the same week last year, Amazon announced a $2 Billion investment in its India unit and has recently stated that India is the next ‘Trillion Dollar’ market, stating that the size of opportunity in India is so large it will be measured in trillions, not billions! There are many excellent figures for India's internet entrepreneurs from the commitment and faith in India of the larger firms & global corporations. There have been many such multi-billion/million deals last year and this year seems just as exciting, if not more. There are also major rumors now that Walmart's entry into Indian e-commerce is very imminent! Things are starting to move extremely quickly over there and the market is about to mature to a completely new level guys! Just yesterday, the Prime Minister of India launched a $1.5 Billion fund for new startups. India truly is on the cusp of a digital revolution. Mobile phone subscriptions in the country have already passed the 1 Billion mark and these are now quickly being replaced by smartphones. This is pretty much a once in a lifetime moment, and the prime minister has stated that “the transformation occuring is on a scale that is, perhaps, unmatched in human history”. The changing landscape in India is now moving at neck breaking speed. Internet access has rapidly expanded and the Reliance Group is due to make a move by summer of this year that will totally change everything in India, with EXTREMELY cheap access to 4G! Already mostly through mobile devices, Indians are now increasingly shifting daily activity online, like reading the newspaper, doing bank transactions and buying goods and services, from shoes to refrigerators etc…. Just this week, an indian firm just released a smartphone that is priced under 500 rupees, less than 5 USD (1% of the price of the latest Apple iPhone). The current median in India age is 27, nearly a full decade younger than in China! LLL.in King, RW1, Srini and 4 others like this. E-commerce in India is growing at a compound annual rate of 34 percent, according to the Internet and Mobile Association of India. By next year, many experts agree on the fact that there will be half a billion Indians online. India has already surpassed the USA in terms of number of users. A flood of cheap smartphones in the market is encouraging rapid internet adoption and an online revolution is taking place. Unlike the other BRIC countries such a China, Russia and Brazil, the consumers in India are largely Anglophone which means that as Indians become the second-largest nationality online (after the Chinese), they simultaneously will become the single largest group on the English-language internet. A vast majority of them using the English language as the preferred way to communicate online! On top of that mobile increase, fibre optic subscribers through the Indian government's NOFN project are likely to reach over 600 million by 2020! With average Internet speeds in India set to triple over the next couple of years, this is going to be the LARGEST MARKET in the world and it will all start kicking off towards sometime this summer! India is the worlds largest democracy and has the second largest population of English speakers in the world. It also currently has the world's largest youth population. In total the population of India is equivalent of more than the populations of Europe and the US combined! Just think about this sort of opportunity guys! Just literally a few months ago, Japans richest man (owner of SoftBank) invested $627million in an Indian web company and stated that is had plans to invest $10Billion over the next couple of years due to the vast market potential of India. India's population has now crossed over the 1 billion mark, more than half of its population are younger than 25 and nearly 70 percent of its 1.25 billion population is under 40. Therefore in absolute numbers, this is actually unprecedented anywhere in the history of the world. It also comes at a time when much of the developed world and also China have aging populations. Overall, India will overtake China as the largest population in the world before 2030. At the current growth rate, India will easily exceed 600 million internet users by 2018 or much before that. This will make India the biggest open internet access market in the world and therefore this is the place to capitalize on some serious growth. And remember guys, India is the largest DEMOCRACY in the world, and that word democracy is what is changing the minds of Google, Twitter, Facebook, Uber etc…to start moving away from China and more into India. India is also set to overtake the U.S. as the world's largest Facebook market by number of users before the end of this year, which already at over 135 million users, is the only country specific market in the world where Facebook is aspiring to have 1 billion users, nowhere else are they or can they even aspire for this guys. It was literally just a few months ago that Zuckerberg met with Modi to discuss the push forward of internet useage in India and has been in India yet again to push his ideas. Discussions are always continuing with the top web corporations and the politicians of India, to push forward Internet useage in the country. India added 100 million new users to the Internet in 2015, taking the country to more than 400 million users -- more than there are residents of the US. But with another 800 million yet to be connected, the world's biggest tech companies are eager to be a part of India's consumer tech boom in the next few years. Between Google last month beginning its mission to hook up train stations around India with free Wi-Fi and Facebook's controversial Free Basics initiative, which will give limited e-services to the poor at no cost, expect the numbers to only accelerate. In 2015, smartphone sales in India eclipsed those in the US for the first time ever, according to Counterpoint Research. China remains the world's largest phone market, but it's nearing saturation point, with growth stalling in 2015 for the first time. The US is a similarly tough nut to crack, with 79 percent of people already owning smartphones, according to ComScore. Due to these statistics and current initiatives and business projects taking place in this country, India is of course set to shortly become the largest population of web users in the world! 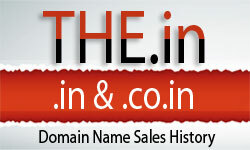 I realize guys that many of you may primarily be involved in .COM and you may ask that although India is rapidly becoming a massive user base in the online world, why would the users move to a cctld like .IN rather than .COM or another of the many new/old extensions? My belief is that .COM is becoming slightly saturated or which I why I chose .IN over .COM when concentrating on ROI. Of course, I believe that .COM is still CURRENTLY king globally and will always be king, there is no denying that. I personally started off in domaining with primarily .coms, .orgs and .nets. I have now no .coms in my portfolio and have also sold most of my .nets and .orgs too to generate enough funds to buy into .IN which I believe is the next big thing for sure! .Com is great for primarily international/USA traffic, but Google has a local search site for many individual countries, for example Google.ca for Canada, Google.fr for France & Google.co.uk for the UK. These local search engines tend to give priority to local domains and Google in India will tend to give priority for .IN extensions when end users are searching for specific items. Therefore IF any major corporation is interested in gaining traffic from INDIAN customers then they will need the .IN extension to further this cause and create a highly ranked online portal to their store/services through the Indian webspace, which now many of them are already doing. I know that algorithms are continually changing and take into account many more other factors than this, and I may not be completely correct in my understanding. But using the .IN extension to start operations in India is a growing market and many global/Indian corporations are already doing this. .IN is now the primary extension for India and is unbeatable in generating traffic for businesses through the web whom want to capitalize on India’s enormous population. LLL.in King, RW1, Kokoro and 1 other person like this. Most companies based within India are using .IN sites as their primary websites and redirecting their .com sites to the .IN ones and having been doing so for many years now. Also, many international companies are already using .IN sites as their primary portals for Indian originated specific traffic and then transferring into their .com sites or even just using the .IN sites as their primary sites over there, built specifically for the Indian market. Most international companies use ccTLDs in this manner and they are not just bought as a defensive move to protect their trademark and name, although this is definitely also a major advantage of owning all important extensions of a brand in new major emerging markets. Also another great stat is that the IMF have concluded that the total size of the Indian economy is set to surpass that of Japan and Germany combined by 2019. Again, why not .com for Indians? Well .com is still used by Indians and it always will be just as it is still used by Germans or the British. But INDIAN users do often prefer the .IN extension over .com, unless of course they are specifically looking for products or services that are based outside of India. This is similar to markets such as the UK in which .co.uk is the predominant extension used, German market where .de is used over .com unless looking for global services etc.....Yet India is even more nationalistic than most of these other countries and in a similar manner to China, Indians always prefer to use INDIAN identifiable services & options due to long established trust and pride in their country and this is exactly why the .IN extension is prime real estate for the Indian webspace. It is also the preferred extension that is being pushed by the Indian government and that is exactly why many are now investing in .IN names. Guys, im sure you're pretty much up to date with the current marketplace anyway but yeah go ahead and check out the statistics for yourself in regards to India and i'm pretty sure that you'll agree with me when I say that it is going to blow up in a massive way! All of these stats that I have mentioned can be verified on many established global business/news sites with a simple google search. There's literally $Billions currently being poured into the Indian Webspace and Indian Internet usage right now, every single western/global company is dying to get in and many Indian companies are racking up their arsenal as we speak. The newly formed government is extremely pro-digital and the word on the street is that they are going to quickly start easing out a lot of national policies, making it easier to carry out business/services online. This already occurred yesterday in the start up sector. The number of end users in India is already set to surpass the number in USA, and we've not even reached the quarter way point in terms of the size of population in India. The major western corporates are already betting big on India and by the end of the year, it'll be far too late to get in on the game as many old school players would've already got a foothold on the major keywords and won't be letting go for spare change. I myself wish I had go in earlier on the .IN game. BUT there is still massive opportunity RIGHT NOW, as it is STILL a buyer’s market which I don’t believe will be the case in one years time! And since the market is on the cusp of exploding in India and I know the potential worth of these names in a year or two time will be immense. Guys, you have to realise that by 2018, India will have twice the number of Internet users as the US does and has already overtaken the US in terms of number of user at the end of last year. Of course the market will take a while to fully mature, but in sheer advertising potential alone, this is amazing! And plus the speed of adoption nowadays both in web services and ecommerce is incredibly fast! India already at this moment in time has over 400 million internet users, which is nearly 17 times the full actual population of the country of Australia guys. And as I write this email this very moment, India is adding 1.25 millions internet users to the web every single week which is nearly 180,000 new unique users of the internet per day! By the end of today, another 180,000 users would've come online and have started searching for things on the web and the same will happening again tomorrow, and the day after and the day after that....ect..... Those figures are just too wild to ignore! Yes of course, all of these users are not mature users as in the west, they will not all buy lots of items on through the web, they may not all spend hours on the web every single day BUT these aspects are rapidly changing and these users are quickly changing their habits and many are starting to replicate our habits here in the west. Once an Indian picks up a smartphone, they will never go back! I think that investors in the web game tend not to pay too much attention on new emerging markets in the beginning, always instead looking towards .com & the western markets which I believe have now started to slowly saturate in terms of growth. Why buy up in Beverly Hills when there is no further growth happening there? When instead we can look at a new neighbourhood that is growing beyond all expectations and will soon be the new Beverly Hills of the East! The time is now, the buyers market is now! I don’t think investors here should miss out on this chance! Obviously no one here will take this information as gospel, so therefore I request anyone whom finds all of this interesting, then please research into this for yourself and I am sure that you will find that adding some nice .ins into your portfolio NOW rather than later will be a good financial decision. LLL.in King, RW1, Deepesh K Patel and 4 others like this. very interesting post. I agree wholeheartedly that indian domains have enormous potential to be a ccTLD on the world stage ,to be appreciated by domain investors , the primary & secondary sales market & end- users. enjoyed reading the post truekumar. Yes .in extension is far more used than .co.in and there is already a revolution on this front. This is all true. I have been watching India for some time now and, if anything, it would be an interesting extension to buy into just to see where it goes. The advertising angle is what I watch the closest though. I have to say 2016 has been the slowest year for my .in domains ever. I don't think I have had one single sale! Not even any offers at Sedo coming in. 2017 can only get better in my case. Still believe in the extension, though. But when on earth is it going to get going? Will and LLL.in King like this. Personally this year has been my best yet - more inquiries, higher offers and bigger sales. Reseller market is more active and profitable now too. However, things are still moving at a much slower pace than I would like. If NIXI can get a bit more involved over the coming months I'm sure we will see a big shift in 2017. We're getting there but gut instinct says we need another 2-3 years of patience before our investments really start to cash in. Truekumar, oneventures, LLL.in King and 1 other person like this. I agree with Will - the number of inquiries and lowball offers has dramatically escalated this year. I'd agree that people still aren't seeing the full value of .in domains, but they're certainly starting to wake up to them. Truekumar, Will and oneventures like this. i experienced what you are talking about. but what can be done? be patient or/and adjust. Like Will said, the reseller market is vibraint, and prices are moving up fast on there. 2017 is already here and we just have to wait a bit longer. wait it out, its worth it. stock of good, short cheap .in/.co.in is rapidly dissapearing, so thats also a good sign. Truekumar, Will, Deepesh K Patel and 2 others like this. Good to hear you have done well this year It does look like the reseller market is doing well at least. I have pretty much stayed out of it this year though. Truekumar, Will and LLL.in King like this. That's nice to hear, Jeff. I guess I have the wrong domains or wrong pricing ;-) Anyway, hoping 2017 will be a good year for all of us. Yeah, after holding on to my .ins for all these years it would be lunatic to let go of them now... And certainly good that prices for short .ins are moving up. Truekumar and LLL.in King like this. There is so much I have picked from this post and it will be exciting to see what's in store for the .IN domain in the next few years. I'm sure it will be such a big market in the next decade or so. This sounds very interesting and its nots surprising given the fast pace growth of India's E-Commerce market.. With the size of the population and rapid influx of the youth generated market it will continue to rise..